19 May 2014. Bristol-Myers Squibb in New York says its engineered antibody elotuzumab received a breakthrough therapy designation from the U.S. Food and Drug Administration to treat multiple myeloma, when used with two other cancer drugs. Elotuzumab is being developed by Bristol-Myers Squibb and AbbVie, in North Chicago, Illinois. 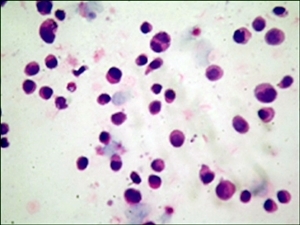 Multiple myeloma is a progressive cancer affecting plasma cells, a type of white blood cell found in bone marrow. Because plasma cells make antibodies, the cancer causes the numbers of antibodies in the blood to rise to abnormal levels, often resulting in a range of serious health problems to the immune system, bones, and kidneys. Elotuzumab is a monoclonal antibody engineered in the lab to bind to a specific cells or proteins from cells causing the cancer. Bristol-Myers Squibb and AbbVie are developing elotuzumab as a means to target Signaling Lymphocyte Activation Molecules, proteins found on myeloma cells but not detected in normal tissue. The Signaling Lymphocyte Activation Molecule is also found on white blood cells considered natural enemies of multiple myeloma cells, and the companies’ research aims to discover ways of using elotuzumab alone or with other drugs to activate these cancer-enemy cells. Bristol-Myers Squibb and AbbVie have a number of clinical trials underway testing elotuzumab under varying conditions, including as a first-line therapy and for patients with relapsed or resistant multiple myeloma. The companies say FDA’s breakthrough designation is a result of findings from an intermediate stage trial testing elotuzumab with lenalidomide, marketed as Revlimid by Celgene as a treatment for mantle cell lymphoma, and dexamethasone, a synthetic steroid used to treat leukemia and lymphoma. Lenalidomide and dexamethasone are already prescribed for some advanced cases of multiple myeloma. Those results showed patients taking the combination of drugs having a median time of 33 months without the disease getting worse, after a median follow-up of about 21 months. FDA designates new therapies as breakthroughs when early clinical evidence shows a substantial improvement over current drugs to treat serious conditions. Once designated as a breakthrough therapy, a drug or biologic can receive early and frequent communications with FDA staff, quick resolution of questions, intensive guidance on drug development, and an organizational commitment from top managers at FDA.